As I mentioned in my previous blog, before heading south I did as much research as I could on what locations to visit at golden hour. If you haven’t been here before it is home to an Early Medieval monastic settlement founded in the 6th century by St Kevin, accompanied by two gorgeous lakes (an upper and lower). Since I hadn’t a clue where I was going I left bright and early on Tuesday morning to scope out the landscape and figure out the best compositions. In the end, I didn’t photograph a single thing because conditions were miserable… Between grey skies and >20mph winds there was no chance of capturing anything meaningful. Luckily, come Wednesday things improved and there was significantly less wind in the valley. When photographing loughs you really want to aim for calm conditions in order to capture reflections on the beautifully still water. Unfortunately this wasn’t going to be possible on my visit, so I settled for a long exposure of the upper lake and used some rocks at the edge of the water as foreground interest. 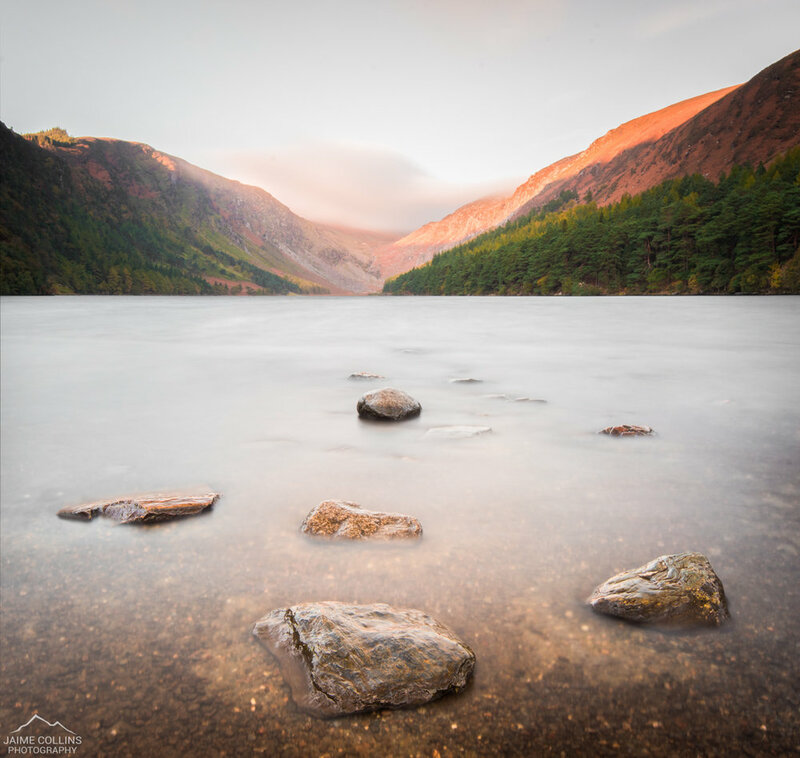 If you ever plan on visiting Glendalough there is a hotel at the lower lake with plenty of free parking spaces available for early risers. There is also a car park at the upper lake but it doesn’t open till later in the day and will cost you €6.